Frankly, there's much more here. 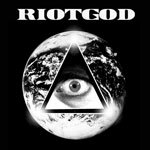 So much more that, while other bands, young and old, are reinventing the current wheel, Riotgod has been busy creating something quite unique unto themselves. I hear clever melodic, yet heavy, hard rock that draws from several streams. The first seems to be the deep waters of late 70s hard rock including shades of Blue Cheer, Cream and even Zep on songs like 'Evil' and Collapsing Stars.' Then there's some basic heavy rock and roll with 80's arena rock qualities like 'High Time' or 'Drone Station.' Finally, I hear some old school psychedelia, particularly in the guitar solos of '9th Life,' 'Crusader' and 'Light Of The Sun.' Riotgod has taken all this roots laden rock created a heavy, melodic, and soulful groove that is all their own, until now. Now we get to enjoy it, too. Where I found myself yawning and Riotgod stumbling a tad was when they ventured into the stoner or modern post grunge thing; though interesting, 'Sweet Kaos' and 'Pinata' fell into this category. Additionally, some songs became tedious when they became too long with repetition. 'Light Of The Sun' and, even though one my favorites, 'The Time Is Now' are culprits. Also, Riotgod could have stopped after the excellent 'Collapsing Stars;' what follows was hardly compelling. Finally, on too many songs Sunshine's vocals seemed unnecessarily muffled as on 'Drone Station.' His voice is too good to be stifled in this way. Overall, Riotgod's debut is noteworthy and pleasing for it's lack of convention. This is not the same old 'cliche-of-the-day' modern American rock. Riotgod is onto something quite good, and dare I say, creative here with their roots-laden heavy melodic rock. They've got the vision and talent to challenge current trends. Very recommended! Riotgod's debut is noteworthy and pleasing for it's lack of convention. This is not the same old 'cliche-of-the-day' modern American rock. Riotgod is onto something quite good, and dare I say, creative here with their roots-laden heavy melodic rock. They've got the vision and talent to challenge current trends.